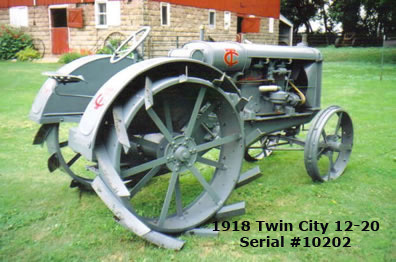 Production of the “baby” Twin City 12-20 was well underway by 1917. This three plow tractor was an advanced unit frame concept powered by an inline sixteen valve 340 cubic inch four cylinder. The transmission and final drives were fully enclosed and running in heavy oil. Weighing just over 5,000 lbs. 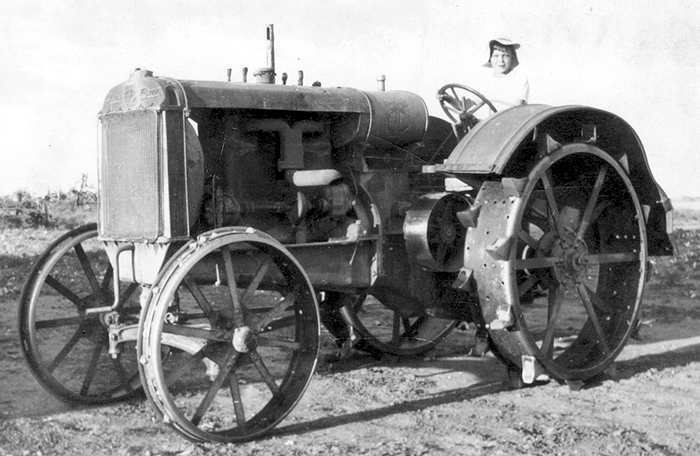 with two forward gears this tractor posted high fuel economy and exceeded its advertised power rating with the use of twin camshafts and four valves per cylinder. At a time when nearly all other manufactures used simple channel frames with open gears, this tractor was truly an engineering marvel. The 12-20 was advertized for the 1919 market year, however, hundreds of them had already been delivered to dealers and customers by mid-year 1918. 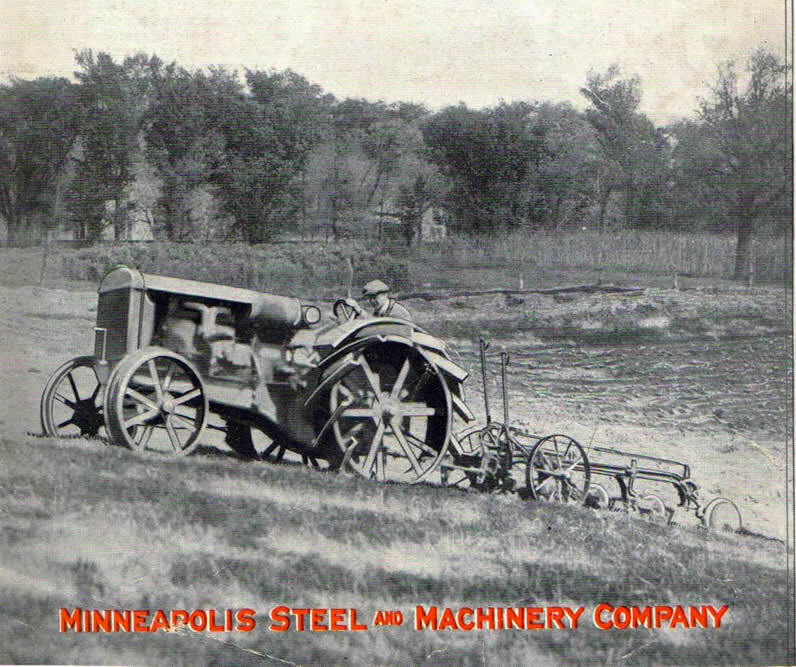 Minneapolis Steel & Machinery Company was not cautious with the introduction of the 12-20. These machines were ahead of schedule, they were mass produced and heavily advertized. When the company’s books were closed on New Years Eve 1919, one third of this tractors total production run had already been sold to serial number 13000. The Nations economic hardships from World War 1 caused sales and production to drop sharply for 1920, requiring five more years to sell the remaining two thirds for a production total of 9,000 units by the end of 1925. In recent years the collecting community has begun to show more interest in the relatively low number of restorable surviving 12-20’s, with special attention to those made in 1918 and 1919. Early units are a nice addition to any collection and get lots of commentary at threshing shows. 12-20’s are pre 1926 and large numbers of them fell victim to the Word War 2 generated scrap drives. 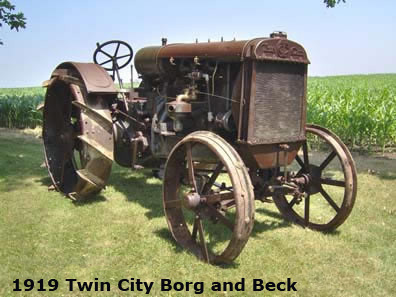 Perhaps the most desirable version would be the Borg & Beck 12-20 (see spotters guide below), but with no serial number listing available to separate them by year of manufacture, it can be difficult for the average enthusiast to identify the early production units and many of them are missing the rather fragile brass serial number plate. I have compiled a spotter’s guide to help collectors make more accurate decisions concerning purchase and restoration of these machines. The following list was developed from bits of surviving information at Minnesota Historical Society, original parts manuals, and many years of parting/restoring efforts for my own two early 12-20's that I now own. Beginning serial number for 1918 is 10201. Hundreds of these machines were already delivered in the spring of 1918 and are photographed harvesting wheat in Kansas in June and July that year. First 505 units in 1918 used a horizontal gas starting tank behind the main fuel tank. Starting tank was placed under the hood from # 10707 to #17034. Starting tank mounted vertically behind main fuel tank from #17035 on. 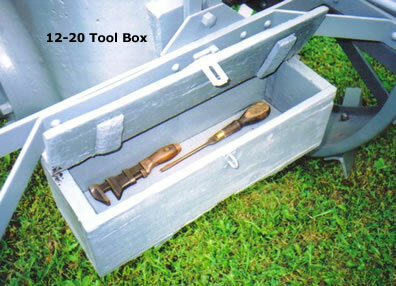 First 1,010 units were equipped with a Bosch D.U.4 magneto with large external/manual impulse starter to #11210. First 1,900 units used a spring loaded Borg & Beck clutch to # 12099. This clutch is operated by depressing a single foot pedal straight down that will spring back up when released. The over center Twin Disc clutch starts at # 12100 and uses a double foot pedal that kicks on with top pedal, then kicks off via bottom pedal. 1918 and 1919 had no visible information on the lower radiator tank. A short time after 1919, raised block letters stating the numerical rating (12-20) were cast into the lower radiator tank. Number of units sold had reached #13000 at the end of 1919. In June 1920 #12278 was delivered to Nebraska testing facility. Results are under test # 19 and showed 18 drawbar and 28 belt hp. Other early components include a Pierce governor, eight spoke front wheels, two piece hand crank and “double hump” or “M” shaped intake manifold. Small, dry cyclonic air washers with a debris collection jar threaded in the bottom were provided by Bennett. Later air cleaners were made by Donaldson. The Pierce governor is a tiny unit that mounts high above the Holley fuel mixer and later Twin City governor mounts near the bottom of the engine block. Bear in mind that eight spoke fronts and early governors were failure prone and many times have been replaced with later ten spoke wheels and TC governors. By 1924 several engine equipment refinements were in place, however, the basic engine castings and internal dimensions remained the same at 4 ¼ x 6. On December 4 th 1925, production had reached # 18733. 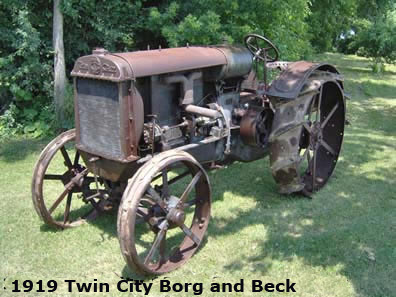 Using the information listed here, the ultimate find for any Twin City collector would be a Borg & Beck 12-20 with no descriptive numbers in the lower radiator tank and as many of the early/correct components in place as possible. Happy hunting! 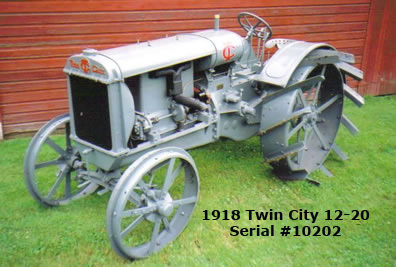 I have an unofficial 12-20 registry with owners names, city/state and tractor serial numbers. 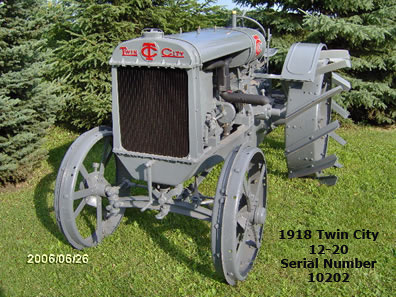 I would appreciate any contributions made by other collectors to help catalog surviving 12-20 tractors.